Job 42:2; Revelations 19:6; Isaiah 46:9,10); omnipresent (Psalm 139:7-12; 147:5); omniscient (Isaiah 46:9-10; Job 42:2; Acts 5:4, 5). We believe that all men have sinned and come short of the glory of God (Romans 3:23; Genesis 3:1-19; Isaiah 53:6), and are subject to eternal punishment (Romans 6:23; Matthew 13:41,42), and need repentance ( Acts 2:38;17:30; Matthew 4:17; Acts 20:21) and regeneration ( John 3:3, 5; Titus 3:5). We believe in the sacrament of Baptism by immersion as a testimony of a convert who has attained a responsible age of 13 years (Matthew 3:16; Mark 1:9, 10; 16:16; Matthew 28:19; Acts 2:38). Infants and children are not baptized, but are dedicated to the Lord (Luke 2:22-24, 34; Mark 10:13-16). We believe in the Sacrament of the Lord's Supper or Holy Communion which should be partaken by all members who are in full fellowship (Luke 22:19-20; Matthew 26:21-29; Acts 20:7; 1 Corinthians 11:23-33). We believe in the Baptism of the Holy Spirit for believers with the initial evidence of speaking in tongues (Joel 2:28, 29; Acts 2:3, 4, 38-39; 10:44-46; 19:1-6). And in the operation of the gifts and fruit of the Holy Spirit (1 Corinthians 12: 8-11; 28-30; Romans 12:6-8 and Galatians 5:22, 23). unsaved. They that are saved to the resurrection of life and the unsaved to the Resurrection of damnation (Acts 1:11; 10:42; Mark 13:26; John 5:28-29; Daniel 12:2; Romans 2:7-11; 6:23). We believe in tithing and in the giving of freewill offerings towards the cause of carrying forward the Kingdom of God. We believe that God blesses a cheerful giver (Genesis 14:18-20; Malachi 3:6-10; Hebrews 7:1-4; Matthew 23:23; Acts 20:35; 1 Corinthians 16:1,2). We believe that the healing of sickness and disease is provided for God's people in the atonement (Isaiah 53:4-5; Matthew 8:7-13;16,17; James 5:14-16; Luke 13:10-16; Acts 10:38; Mark 16:17,18). However, the Church is not opposed to medication by qualified medical practitioners. This is the Official Church of Pentecost Europe App for iOS IPhone and Android. 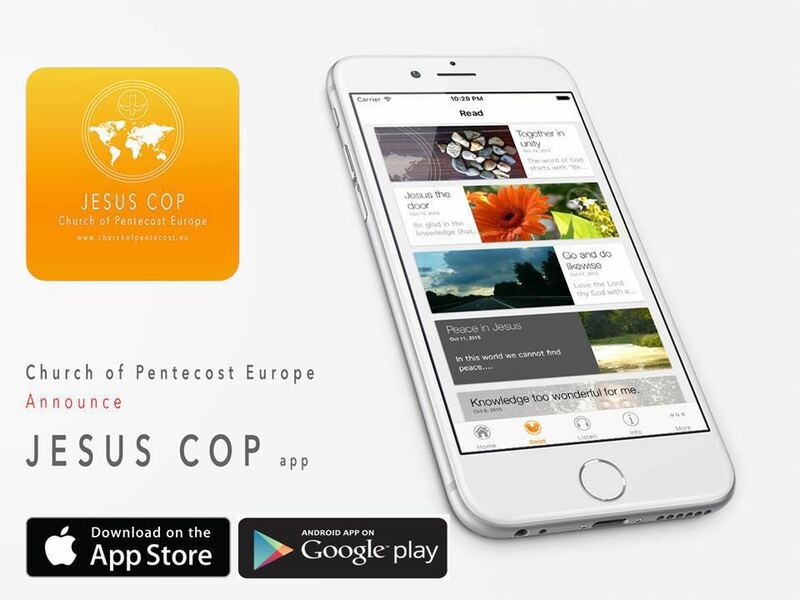 As Jesus is the heart and author of the Church of Pentecost (COP), this APP has been named Jesus COP. The app is developed to connect with the members and all information concerning their local church. As we were commissioned to bring the gospel of Jesus Christ to the whole world, this App will serve as a tool to help reach many. Download the app and start using it.